MANTRA, a sanitation program transforming rural livelihoods in eastern India, last night won the Grand Award at GLOBAL+5, the first ever festival of global governance organized by The Global Journal in Geneva. 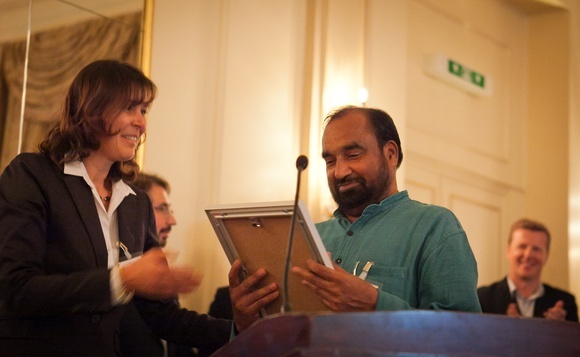 Receiving the award from Angela de Wolff (President of Sustainable Finance Geneva) before a packed international audience at the Four Seasons Hotel des Bergues, MANTRA leader Joe Madiath expressed his surprise that a project focusing on the unglamorous issue of sanitation "could lead to such a big prize." The MANTRA model has reached almost 1,000 villages in India, reducing waterborne diseases by 80 percent and empowering communities to take charge of their own development path. The awards ceremony began with remarks from the former Prime Minister of Greece, George Papandreou, speaking on behalf of his fellow GLOBAL+5 Jury. Emphasizing how difficult it had been to choose between the project finalists, Mr Papandreou noted that "every single one showed a spirit of hope, a spirit of optimism, a spirit of innovation, and a spirit of energy." Reflecting more broadly on the role of global governance in responding to global challenges, he evoked the European Union "experiment" and his own experience leading Greece during the current debt crisis to suggest Europe would "play a major role in humanizing globalization, or else globalization will dehumanize Europe." Three other exciting projects received prizes at the ceremony. The GLOBAL+5 Impact Award, presented by Karin Hagemann (Director for Public Sector, International Organizations & Civil Society at KPMG) was won by The Working World. Based in Argentina, Nicaragua and the United States, the NGO has developed an inspired alternative finance model to provide low-interest, no-collateral loans to support the creation and growth of sustainable worker cooperatives running recovered enterprises. The GLOBAL+5 Innovation Award was presented by Fred Dust (Partner at global design consultancy IDEO) to Deepwater Project, an initiative based around a unique solar-powered scientific voyage to explore the effect of climate change on the Gulf Stream. Accepting the award, project leader Martin Beniston (a Nobel laureate for his work with the Intergovernmental Panel on Cimate Change), reminded the audience that despite being overshadowed in recent times by economic issues, global warming had not gone away and required increased public attention. The GLOBAL+5 Empowerment Award was presented by Eva-Maria Nag (Executive Editor of the Global Policy Journal) to the social movement Russia Behind Bars. Co-founded and led by Olga Romanova, a prominent journalist and member of the anti-Putin opposition, the group continues to fight bravely against corruption in the justice system in Russia, while advocating for lasting legal reform. The Jury also used its discretion to highlight three additional projects deserving of a ‘special mention’. Announced by David Held (Professor of Politics and International Relations at Durham University), these were: Discovering Hands, an innovative German program training blind women to detect the early signs of breast cancer through their heightened sense of touch; Sustainable Infrastructure Fund, a project that aims to attract institutional investment to drive sustainable infrastructure policy; and Peace for Mexico – Mexico for Peace, a new grassroots campaign supporting civic initiatives challenging the culture of narco-violence in Mexico. Each of the projects featured at GLOBAL+5 have the power to stimulate innovation and contribute to our collective attempts to address the most pressing global challenges in the next five years. Further details can be found on our website. Stay tuned for the opportunity to vote online for your favorite project.